Join the discussion on our forums! Come discuss Volcano over in our dedicated Volcano discussion topic. This probably needs a higher overload, maybe 3 or 4. It's kind of insane to clear a mid-sized board for five mana. That or it could also split to players to lose some consistency. Wiping non-small minion boards with one spell isn't healthy for the game. This is like a less flexible Equality. Card is OP when you are behind, but a dead card when you are ahead. It is hard to truly get ahead with this card. How to even try to face this card in arena. Your opponent plays volcano everytime he loses board control and wins from there. I just killed a booster/silence priest in the most amusing way possible with this card--I milled him to death. He decided to boost his Acolyte of Pain with a Power Word: Shield [/card], 3 [card]divine spirit and an Inner Fire into a 40/40 creature after I had wasted my hexes on his other minions. It was turn 10 and I ran my Thing from Below into his acolyte, causing him to draw a card...then dropped 2 Volcano on him, forcing him to draw his entire deck and die from mill damage (with a ton of draws still left), while running out several turns worth of time. So this card is totally bonkers in arena when you're behind. Say what you want about it, i think this is better than Flamestrike because it can kill big minions. Yep, just came here to post how I won a game by playing Volcano vs. Bittertide Hydra. Crazy fun. If we look at the card itself, it is quite good as it is a great board-clear when you don't have a board. However, I think this card is not compatible with the new meta Shaman's decks, which are elemental deck and murloc deck. Murloc deck will try to fill their boards with murrrrrrlocs and not possible to play volcano, and for elemental deck shaman already has some good plays like the primal lord and maelstorm portal. So, I think there may not be a place for volcano to be played in these decks. Since Elemental Destruction is rotating away this is a really interesting card. 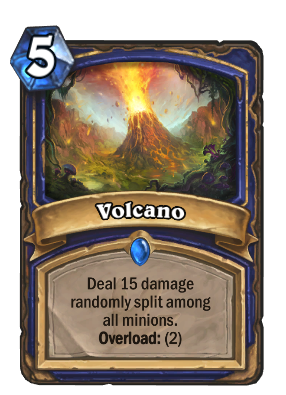 It seems Blizzard is aiming for a slower version of Shaman and Volcano is a really good AoE when you have no board, and you will have no board as a Control Shaman except for random totems. The funny thing is that you never wanna hero power for a spell damage totem before playing this lol.